With a number that many warned would be impacted by not one by two hurricanes and as such the forecast range was extremely wide, from 105K to 253K, moments ago the BLS reported that indeed consensus was way off when it announced that in October payrolls soared by 250K, just shy of the highest Wall Street estimate, and more than double last month's downward revised 118K (down from 134K). At the same time, August was revised up from +270,000 to +286,000, offseting the upward revision in August. After revisions, job gains have averaged 218,000 over the past 3 months. 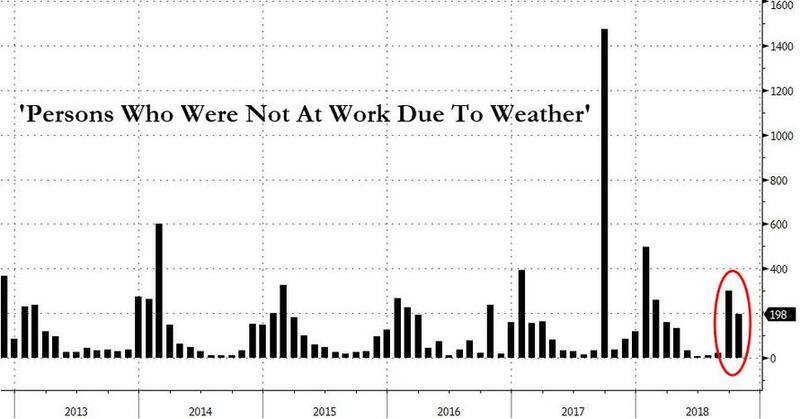 Still, like last month, one should be careful with today's weather-affect month: as Bloomberg economist Tim Mahedy writes, "just as economists should have avoided conclusions last month when payrolls surprised on the downside at 118k, today’s strong print of 250k should be understood in the context of payback from Hurricane Florence.'" ... what is curious about the number is that according to the BLS, "Hurricane Michael had no discernible effect on the national employment and unemployment estimates for October, and response rates for the two surveys were within normal ranges." 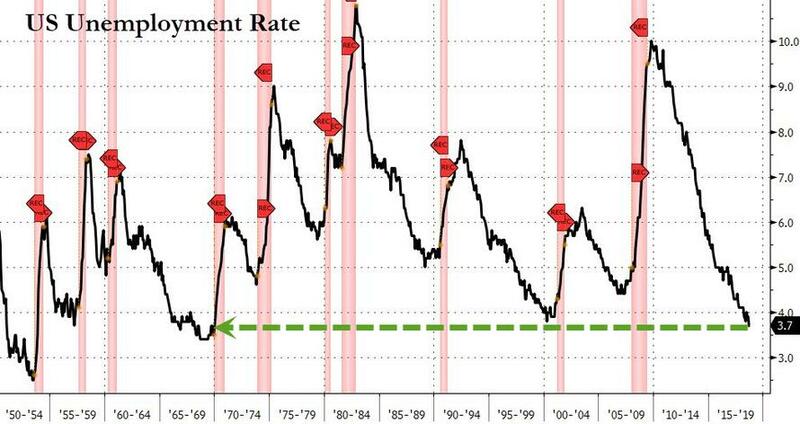 Going back to the data, the unemployment rate in October remained unchanged at 3.7%, as the number of employed workers (Household Survey) soared by 600K to a record 156.562MM employed Americans, while the number unemployed rose modestly to 6.075MM from 5.964M. 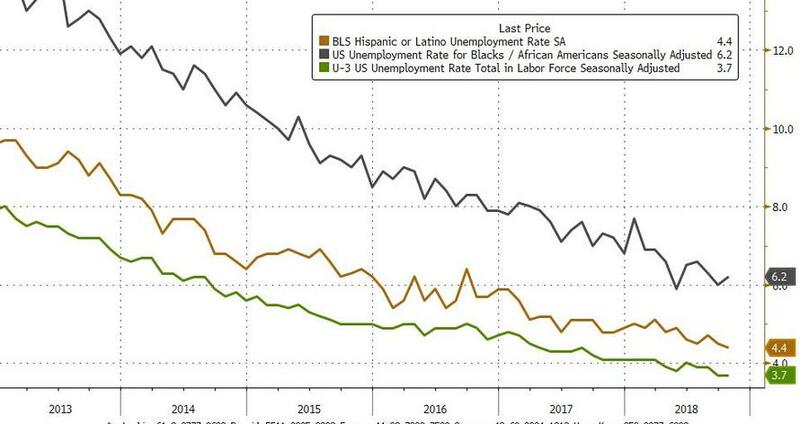 One data point that will no doubt be seized upon by Trump with the midterms next week, is that Hispanic unemployment dropped to a record low (even as joblessness for black Americans rose fractionally) White and Asian unemployment are hanging in the low 3s. The people not in the labor force shrank by nearly half a million, from 96.364MM to 95.877M. The labor force participation rate rose from 62.7% to 62.9%, well above the 62.7% consensus estimate. 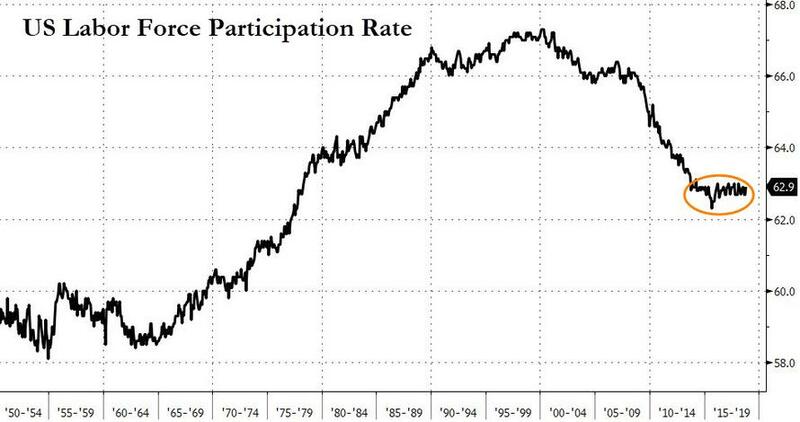 That's a big jump in the participation rate, which suggests consumer confidence will remain at a high level. 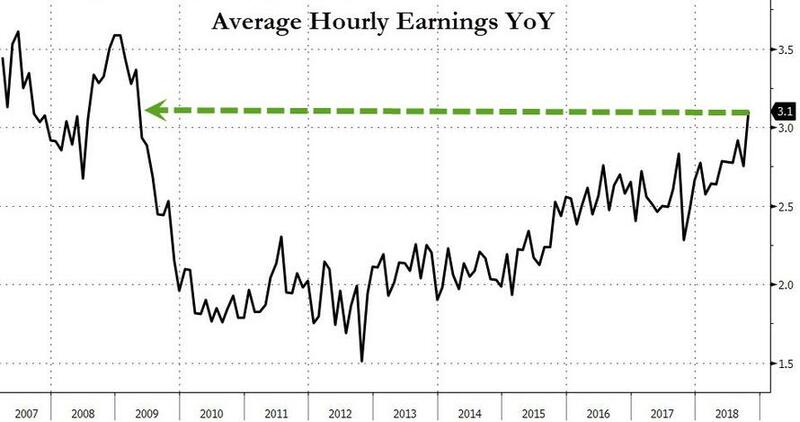 But the most important part of today's report is that the increase in average hourly earnings jumped by 3.1%, in line with expectations and up from 2.8% in September. As we previewed overnight, this was the highest print since April 2009. 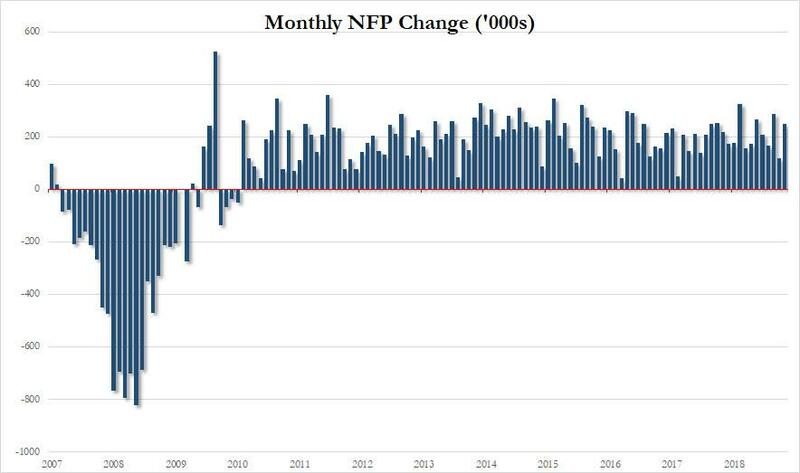 While much of this jump is due to calendar and base effects, the Fed will certainly pay attention to what it increasingly sees as an overheating economy which is drifting every further from "Goldilocks." As a result, expect odds of more rate hikes in 2019 to jump accordingly. was unchanged over the month. Breaking down the jobs by category, in October, job growth occurred in health care, in manufacturing, in construction, and in transportation and warehousing. However, the overall breadth of job gains was narrow, with one in six new hires going to the leisure and hospitality industry where wages are low. Employment in manufacturing increased by 32,000. Most of the increase occurred in durable goods manufacturing, with a gain in transportation equipment (+10,000). Manufacturing has added 296,000 jobs over the year, largely in durable goods industries. Transportation and warehousing added 25,000 jobs in October. Within the industry, employment growth occurred in couriers and messengers (+8,000) and in warehousing and storage (+8,000). Over the year, employment in transportation and warehousing has increased by 184,000. Employment in leisure and hospitality edged up in October (+42,000). Employment was unchanged in September, likely reflecting the impact of Hurricane Florence. The average gain for the 2 months combined (+21,000) was the same as the average monthly gain in the industry for the 12-month period prior to September. Employment in professional and business services continued to trend up (+35,000). Over the year, the industry has added 516,000 jobs. Overall, a very strong job report with hourly earnings growth now well inside the "redline", and assuring not only a December rate hike, but - all else equal - quite a few more rate hikes in 2019.